Performed by Pendragon as part of a medley on their 2005 CD Artistic License . "The Ballad of Anne Hutchinson"
From his 2011 album Circumstantial Evidence. The "Ballad of John Henry"-style song tells the story of Anne Hutchinson's fight against religious persecution. "The Ballad of the Gaspee Affair"
Composed by Robert Archetto in 1972; recorded in 1975 in commemoration of Rhode Island's 350th year. The Lyrics tell the story of one of the first acts of rebellion by American Colonists against the British Empire. From the 2006 CD, Past Due . "Blackstone Valley" is the unofficial anthem of the Blackstone River Valley National Heritage Corridor. You can download it for free (as of June 2015) from the Plainfolk Music Showcase on the Plainfolk website. "Bombardment of Bristol, Rhode Island"
From the 1999 album Library of Congress Recordings, March 25, 1947. "This ballad tells the story of the first bombardment of Bristol, Rhode Island by the British on October 7, 1775, during the American Revolution." Anti(? )-Buddy-for-Mayor song from 2014. Note: contains explicit lyrics. "If you're feelin' unlucky, vote for Buddy." "Can't Stop The Feeling... School Is Closed!" Moses Brown School head Matt Glendinning announces a snow day with his 2017 parody cover of Justin Timberlake's "Can't Stop The Feeling." This is Glendinning's third snow day song. A parody to the tune of 1977's "Baby Come Back" by Player, lamenting a perceived lack of quality between the Rhode Island gubernatorial terms of Lincoln Chaffee (2011-'15) and Gina Raimondo (2015-'19). "Chooch to Gooch: The Ten Steps of Disco Dancin'"
Not a lot of Rhode Island references in this song (unless you count all the fabulous gooch-ness), but plenty in the video. My heart she was reborn. From the 2018 album Providence . Crescent Park, an old school amusement park, was literally a half mile from my house, as the crow flies. It was a much further walk, because the crow would be flying across a body of water called Bullock's Cove. Riverside was the town across the tracks, which all of us in Barrington considered beneath us. Barrington was the upper crust town with secrets and sorrow just beneath the surface. Of course, my dad was a pastor there, so we weren't well to do; we just lived there. The pull of a forbidden place is as old as time itself, whether it's a tree in the Garden of Eden or Pleasure Island for Pinocchio. Crescent Park was the closest amusement park to Barrington, yet we usually went to Lincoln Park in Dartmouth, 45 minutes away. I don't know why. They had the better roller coaster, I guess. One day, a neighbor boy named Richard and I snuck off to the park, and as the song says, experienced the rides, deep fried food, cigarettes, and nausea. Our parents never knew until I confessed to my mother. I was never good at keeping my own secrets—yours, yes; mine, no. Being a preacher's kid meant you had verses swimming around your head like "Your sin will find you out," so I would just cut to the chase and bare all. It was a three person operation: one to get people seated and start their ride, and two brakemen—one for each of the hairpin turns the cars would careen through. The park was failing and that meant that I was the only person running the ride. I would start the ride, then run to the first brake, and then to the second. Sometimes things were so slow that I would forget that I'd put a person on the ride, and they would be on the most terrifying ride of their life. No brakes! They would come crashing to the end of the ride, and I'm amazed no one ever got a bloody nose due to my slothfulness. I would be reading a book (I believe that summer it was a CS Lewis book called Perelandra ), when BAM! Someone's ride would end. I've been reading Stephen King's Joyland , about an amusement park, and it is so similar to my experience at Crescent Park. Seedy, scary, yet somehow a weird little community of summer workers like me and year-rounders like Mr. Perry who ran the place. At the end of the day, the folks across the tracks were no different than the privileged upper crusters in Barrington. We recorded this song, like the others, live in the studio, with the exception of John Scofield's guitar, which he added later in New England, which seems appropriate. I tried to play the solo piano as if it were one of the shaky, unpredictable carny rides at the park, just like real life, I suppose... shaky, unpredictable, and occasionally thrilling. "The Diva of the Silver Top Diner"
From the 2003 CD The Diva of the Silver Top Diner. Parody about the trials and tribulations of getting your license renewed, set to the tune of The Village People's "Y.M.C.A." It satisfies one's latent need for danger. When you're confronted by a Toyota-wielding stranger. Nine white knuckles around the wheel, one finger to salute your fellow man. Covered by Marc Bernier on the 2010 CD Yup, I Said That. A Compilation of Artists Performing the 'Classic' Hits of Jon Campbell. The song tells the true story of Conanicut resident John Eldred, who, in 1775, "lobbed cannonballs and cannonball sized stones at British ships from behind rocks on his farm north of Potter's Cove, until he finally tore out a sail and the British came ashore and spiked the gun." From the 2006 CD Over the Mountain, Across the Valley and Back to the Stars. Sung to the tune of "Yankee Doodle," this song describes the first attempt at cooperation between French and American forces at Newport in August 1778. Lyrics, with footnotes, can be found on AmericanRevolution.org. This is the story 'bout a man named Vito. And he moved to Barrington. On New York Electric Piano's 2005 album Citizen Zen. This is an instrumental jazz track named for its lead instrument, the Fender Rhodes piano, which was named, not for the thirteenth state, but for its inventor, Harold Rhodes. "Ferrying to the Isle of Block"
From the 2004 CD Catch and Release. The song relates the harrowing tale of a particularly tempestuous crossing from Point Judith to Block Island. Most of this 2015 song's lyrical content is about the singer's hardships, with the occasional refrain (voiced by Alanna Buffi), "A cookie tastes better with coffee milk." Portions of the video were shot in and around General Street Park, between Admiral Street and Douglas Avenue in Providence. Note: contains explicit lyrics. "...if it's naughty and it's nautical, ol' Freddy's got the stuff." From the 2000 CD Keep On Fishin'. Covered by Robbie O'Connell on the 2010 CD Yup, I Said That. A Compilation of Artists Performing the 'Classic' Hits of Jon Campbell. Black Rock Beach is located on the southern end of Block Island and is pretty secluded—so much so that uninhibited beachgoers are known to enjoy its solitude sans bathing suit. This acoustic tune describes the beach on a moonlit night. During the World War II years, according to one of our correspondents, WJAR would play this song every night at midnight. At the end, the announcer would say, "To all our friends on the East Coast, good morning. To all our friends on the West Coast, good night. And to our friends everywhere, good luck." A parody from the 2014 campaign season, set to the title tune of the rock opera Hair . Moses Brown School head Matt Glendinning announces a snow day with his 2016 parody cover of Adele's "Hello." This is Glendinning's second snow day song. From the 2004 CD The Bloudy Tenent Truth and Peace. From the 2000 album Holiday in Rhode Island. From the 2011 CD Detour. Just as her father came across the sea. You might wonder just how many Providences there are that the songwriters felt the need to specify "the one in Rhode Island." Well, there are quite a few, actually. Arizona, Illinois, Indiana, Kentucky, Louisiana, Maryland, North Carolina, New York, Pennsylvania, and Utah all have one. Additionally, look at maps of Iowa, New Jersey, Pennsylvania, and Tennessee and you'll find a New Providence on each one. And don't leave out Virginia—that's where you'll find Providence Forge. This version by David Kearsley is from 2012. "Manisses" is the Narragansett Indian name for Block Island. Kermit: So trust my navigation. Fozzie: California here we come, that pie-in-the-sky land. Fozzie: Though sadly we just left Rhode Island. Kermit: (spoken) We did what? Fozzie: (spoken) Just forget it. This song was often played as a sort of unofficial theme song during former Providence Mayor Buddy Cianci's political career. Warwick resident Rooney composed this song in 1902, and it apparently was a popular selection in Newport in the 1920s. 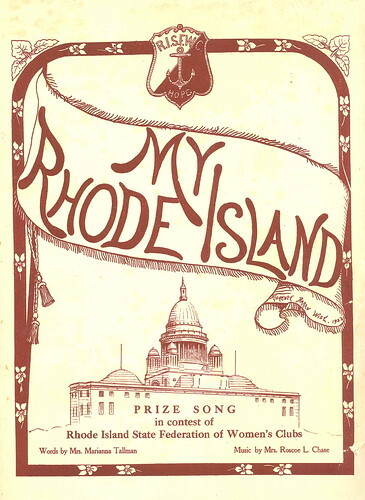 This tune won first prize in a song writing contest held by the Rhode Island State Federation of Women's Clubs in 1923.